Sandals are a god-send when you are traveling or doing sport or on vacation! They are lighter than boots, easy to pack, easy to clean, don't get as stinky as shoes and of course, are great when you are in a hot country or hanging at the beach. And although there are a few newcomers on the block, it still comes down to Chacos vs Tevas, right? Which should you buy for your next trip? Let's take a look and the pros, the cons and all the nitty gritty. of these two leading sandal brands. The first thing you need to think about is when you are going to use them. Or, put another way, your main reason for buying them. This will influence a lot of the other factors in choosing your ideal sandal. Are you using them for long term travel, sports, hiking, around town or home? 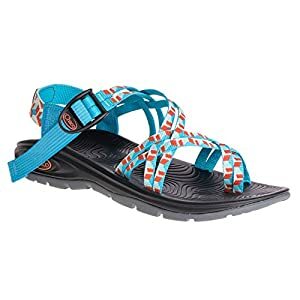 Chacos​ were designed for water sports for example, and have great footbed grip for your foot, as well as a toe holder. So water sport lovers might prefer these. Weight is not complex. It's heavy or it's not. But, the question is also what are you using them for? How long these sandals last might be an issue if you plan to use them for a long time​.But durability affects weight in most cases. So, it's a compromise. People prefer different things when it comes to fit too. Do you want them to be super well fitting and tight so you can hike in them over mixed terrain. Or are you planning on just lazing at the beach and walking around town in them. You need to decide how much you want to pay and what you are getting in return. Both these sandal makers are not in the "cheap" category, but their various models have different price points. So, decide what you are willing to pay for the thing you may wear daily while traveling, or only once a year on that beach vacation. Tevas are far simpler to put on with their velcro straps and tend to have a softer, more forgiving footbed. 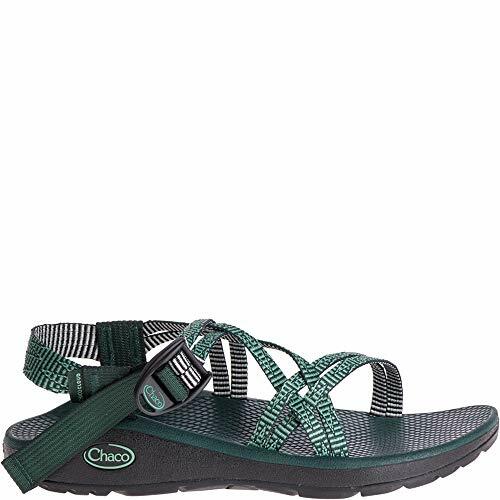 On the other hand, Chacos have a more robust sole and better footbed, as well as a more adjustable strap. The only downside is the straps can take some time to customize. Now, let's take a closer look at the differences so you can really see which one suits you. Chacos produce one hell of a robust sandal. And for many hikers, campers and even people around water - these are the sandals they swear by! Why do people love these babies so much? They are kinda built like a hummer! At least the hummer of the sandal world. That means they are solid, durable and will last you for years. And just a quick side note, they also repair almost any part of their sandals, including sole replacements. So even when they wear out you can keep 'em running for years! Something I wish I could do with all my favorite and worn in shoes and sandals. These sandals are also awesome for any kind of water activity. In fact, that is why the company started. So they specialize in this. The foot bed is specifically non-slip, so if you hike through water, raft or kayak, these sandals are great. One big downside is that Chacos are quite heavy when compared to Tevas. Weighing 1.9lb to 1.25lb on an average pair, just to give you an idea. However, one reason I prefer Chacos is the foot bed. Although it takes a while to "bed-in" to your foot (for some people a few months) once it does, it can fit way better than most sandals. As you can see in the image above, it does not have all those heel and toes grooves that other sandals have which "assume" your foot shape. Instead, you have to work it in over time. But the end result is "your" own foot bed. In 2016, Chacos replaced their Vibram sole with their own branded one. They want to offer the best gripping sandal, so they made their own! For some people Vibram (the renowned Italian sole maker) is the only way to go - because they are renowned for having insane grip. 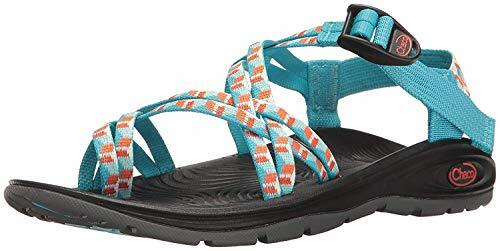 However, Chacos have built a solid sole and their focus on grip in wet conditions means it might even be better than the classic Vibram everyone else uses. Another unique part of the Chaco sandals is their strap system. Unlike on most sandals where you just tighten the strap or buckle, they use a complete loop that holds "the whole foot". One challenge with this systel is that it can take a while to get it right. And it makes getting the sandal on and off a bit fiddlier. But the added hold is worth it. 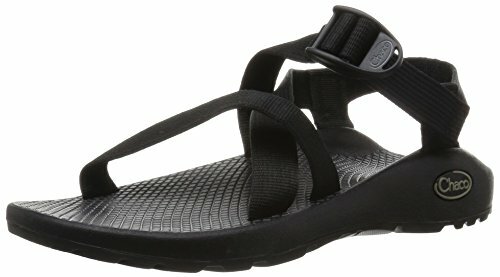 Chacos also offer sandals with and without toe strap (z1 vs z2 models). So, if you are confused by these names don't be. Z1 is without the toe strap. Some people love the toe strap as it secures the sandal to your foot a lot better. Which is great if you are in the water a lot for example. Other people just find it annoying, especially if you want a more relaxed fit and are not planning on doing sport with it. The ZX models have a double criss cross strap instead of just the single wider strap (see images below). But the same applies with the ZX1 (without toe strap) vs ZX2 (with toe strap). The last thing I want to mention is the weight of the sandals, as Chacos are quite a bit heavier than the Tevas. People who swear by these sandals don't care because the extra weight means they are more solid and you don't feel the ground as much. However, Chaco has been listening to the public and also came out with a lighter version of the sandals recently - The Zvolv. So, if weight is a problem for you, check out those. They actually to have lots of new options, so be sure to check what is available. Below: is a video showing you how the Chacos work and the great support from the footbed. Just be aware, this video is old, so the sole has changed from Vibram. Quite heavy, although there are lighter version than the "classic"
Teva is the classic travel or hiking sandal. And for many people, there is no other brand of sandal. Their sandals are super comfortable, and I have almost cried when some pairs I have had broke and had to be thrown out! The big thing you notice with Tevas is that they are a great day to day sandal. Easy to get on and off with the velcro straps. Light weight compared to the Chaco, and still with quite a decent grip. That is why I tend to use these for traveling, when I don't intend on hiking in them. As I mentioned, the straps are a bit easier to handle on these sandals, but they don't have the toe holder. So, you do tend to move around in them a little more on the front. But if you tighten both straps (front and back) then you are usually good to go. Teva uses a velcro system so it can wear out over time (we all know how velcro goes once it gets fluff on it). So, in this area the Chacos with their plastic buckle are built to last. The Teva footbed also tends to be pretty comfy, especially right out of the box. But, they don't have as good a non-slip as the Chacos (which, to be fair, are specifically designed for water!). The Tevas do tend to dry out quicker on the straps though. The sole on the Teva has a decent grip. But the sandal overall is not that thick as the Chaco. So, you might notice more of what you are walking on (eg. rocks). However, for most day to day and occasional water crossings (for hikers), this won't be an issue. A couple of other things worth mentioning on the Tevas: Anti-microbial footbed (less odour) and a shockpad in the heal. 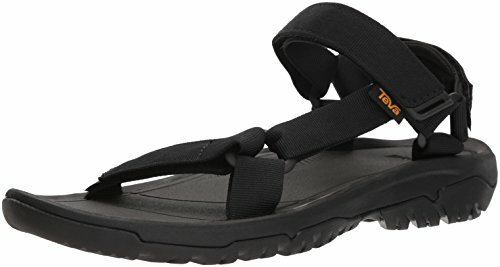 All in all I love the Teva as a light weight travel sandal that can also double as something I use on small hikes (when it's too hot for boots) or when I go on a kayak trip. Note: Although I have not bought a pair for a few years, so I did a quick trawl of the Amazon reviews and there seems to be more quality issues than there used to be. Also, a lot of people complain that they oversize these things, so you may want to order it a little smaller than usual or know that you can easily exchange them. Never an easy decision, I know. But to me it comes down to a few simple questions. Are you using these for just walking around town or on vacation - go with the Tevas. Comfy, light-weight, easy to get used to. Heavy duty hiking or longer walks? I am leaning towards the Chacos. With a better (and replaceable) sole, a footbed that gradually moulds to your foot. And straps that last (not velcro).